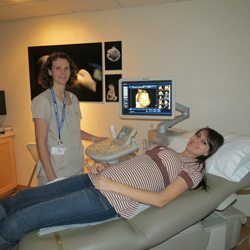 Ultrasound imaging, also called ultrasound scanning or sonography, involves exposing part of the body to high-frequency sound waves to produce pictures of the inside of the body. Ultrasound examinations do not use ionizing radiation (as used in x-rays). Because ultrasound images are captured in real-time, they can show the structure and movement of the body’s internal organs, as well as blood flowing through blood vessels. Obstetrical ultrasound provides pictures of an embryo or fetus within a woman’s uterus, as well as the mother’s uterus and ovaries. In addition, thyroid and breast as well as muskoskeletal and male and female pelvic structures are often evaluted with ultrasound imaging as well. General ultrasound is also used to guide procedures such as needle biopsies, in which needles are used to extract a sample of cells from organs for laboratory testing.